The best email client for Windows? 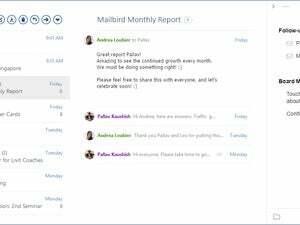 Mailbird goes multi-account. It’s been two months now since I went all in on Mailbird, the self proclaimed “best email client for Windows”. In my last post on the topic, I reserved judgment on the system until I was able to spend more time with it as my daily e-mail client. Having done that, I’m ready to make a decision. I’ve been running Mailbird as my only desktop email client since November. Using the long awaited multi-account feature, I have 8 Gmail accounts connected and I have it installed on my work machines and my home machine. So how does it stack up as a workhorse email client? Let’s find out. A major problem I’ve always had with other email clients is that over time, the amount of email and the number of accounts I have cause the systems to slowly degrade in performance down to a pitiful state. With Mailbird, I’ve yet to experience any change in performance regardless of how much mail is coming in. I attribute this to the fact that Mailbird was designed from scratch to be optimized for webmail services, in my case Gmail. Another problem I’ve had in the past is Calendar sharing and synchronization. With Mailbird, they’ve chosen to forego building their own calendar app and instead integrate Google Calendar into the client. This really just frames in the Google Calendar web page, but it works well and provides a familiar experience. Since we are a Google Apps for Business user, everything connects seamlessly including company contacts and shared calendars. The calendar app only works with Google Calendar so far, so users of other email services are out of luck here. Speaking of the calendar, one fairly annoying problem with it is the acceptance of appointment requests from email. It works pretty good when the appointment request is generated from Google calendar, but falls on its face when it comes from another system like Exchange server. If the appointment arrives as a .ics attachment, I routinely have to open Gmail in a browser to respond to the request. This may get ironed out in a future update. An additional annoyance is that there is no common account for Mailbird which saves and synchronizes your settings. This means that your home installation of Mailbird needs to be set up independently of your work installation and so forth. When you’ve got 8 - 10 accounts to configure, signatures to add, and preferences to adjust, it can be a burden. With such a big focus on cloud services it seems like an obvious feature to have. All in all though, there is a lot to like. A slew of shortcuts, an intuitive and responsive UI, an evolving codebase, and oh yeah, it’s free for the lite version. In fact it’s free for all versions for the time being. Once it’s out of beta the Pro version will jump up to a reasonable $12/year or $48 for life, not exactly budget busting. The business version is even more affordable at $9/year or $36 for life. Mailbird provides around a dozen apps which integrate into a variety of popular services such as Dropbox, Evernote, Facebook, and Google Drive. Like the calendar app, these integrations are mostly just pulling in a framed versions of the platform, but some of them like Facebook tie into your email to provide additional context to the contact on an email. The framed apps are still a welcomed addition. It saves you from having to switch over to a browser to reach them when you’re mid-mail. It’s only going to get better from here. There have already been several releases since I first started using it which have resolved many bugs and have added new features. I’m excited to see the release of Wingman, their email productivity product which will come packed with the pro version of Mailbird in the (hopefully) near future. Mailbird has won the leading role for email in my life. It’s not perfect, but it’s the closest yet for a user who relies on Google services to get work done.